Metrist - Spoils. Vinyl EP. Bleep. Where To Now? 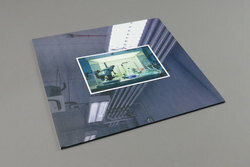 (Wanda Group, Beatrice Dillon) drop the latest release from young British upstart Metrist. It’s hard to know what to make of Metrist’s sound at first. It’s definitely rooted in techno, but the way the sounds interact seems more rooted in sound art and music concrete - but then again, it’s too bodymoving to be those things either. Hemlock-style chewed-up club music? The beats are too propulsive. Hessle? Too weird. PC Music? Too punk. What we’re trying to say is that we haven’t heard anything like this in a while, and it’s got us going. Sure to be melting your brain in a dance very soon.